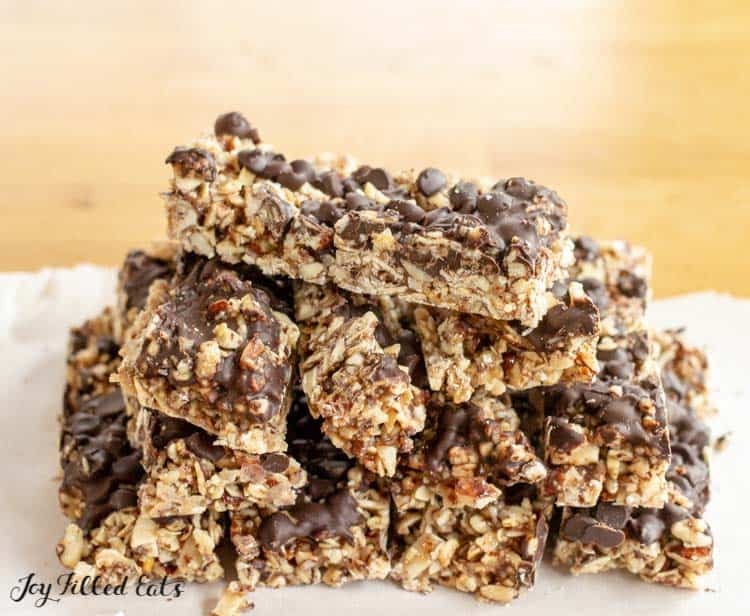 This No Bake Homemade Granola Bars Recipe has just 6 ingredients and takes 10 minutes to make. My healthy granola bars are perfect to keep in your purse for emergencies or send in your child’s lunchbox to school. I grew up taking lunch to school and Quaker Chewy Granola Bars were always a staple. I liked all the flavors but my favorite was the classic chocolate chip. There are times now when I’m running errands that I wish I could just grab a granola bar and keep going. But of all the healthy granola bars I’ve tried none of them hit the spot. 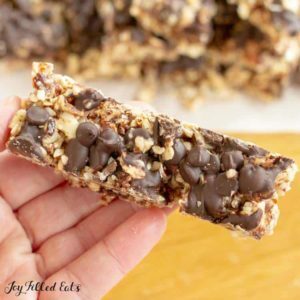 When I decided to make my own No Bake Granola Bars Recipe I knew that I wanted simple flavors, simple ingredients, and chocolate chips. This combination of flavors and textures reminds me of those lunch box chocolate chip granola bars I grew up on. 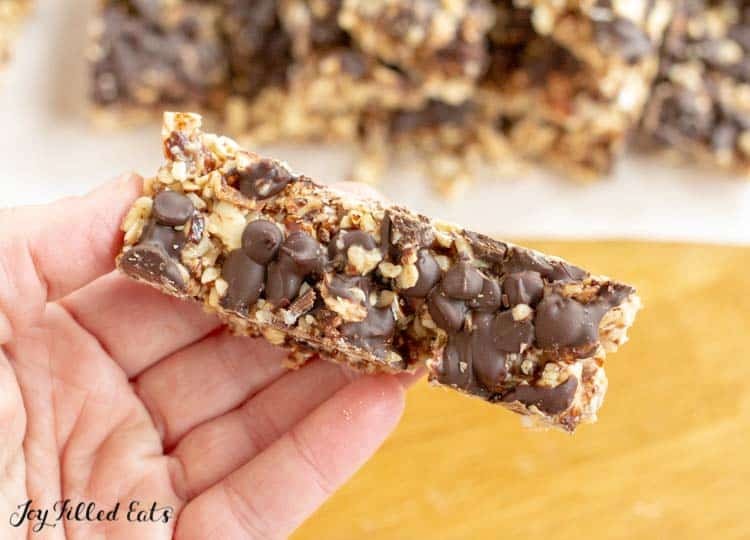 These granola bars are chewy, crunchy, sweet, and have just the right amount of chocolate chips. In my opinion, this is the perfect healthy chewy granola bar recipe! 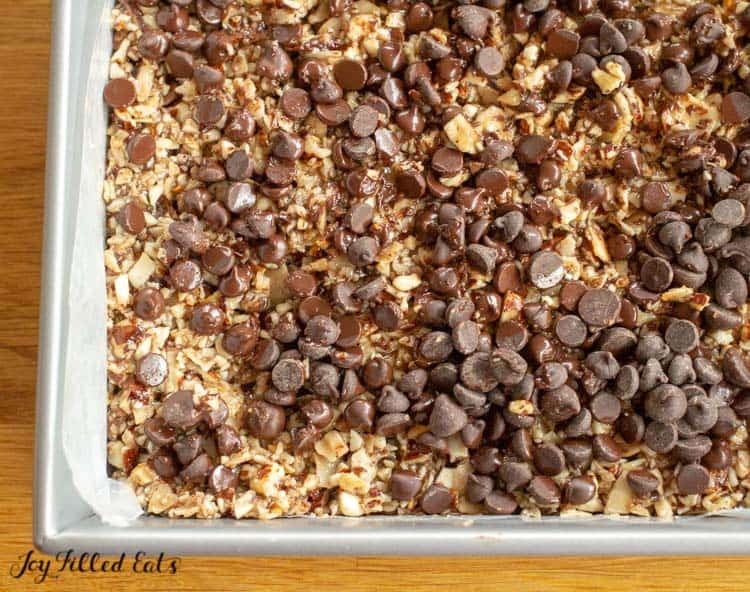 To make granola bars you just hold some ingredients together with syrup. You can make them with almost anything and I’m sure you’ve seen some odd ones in the store before. Pumpkin Seeds + Goji Berries + Raw Cacao Butter + Pistachios + Himalayan Sea Salt. I think I’ll stick with almonds, coconut, and chocolate chips. 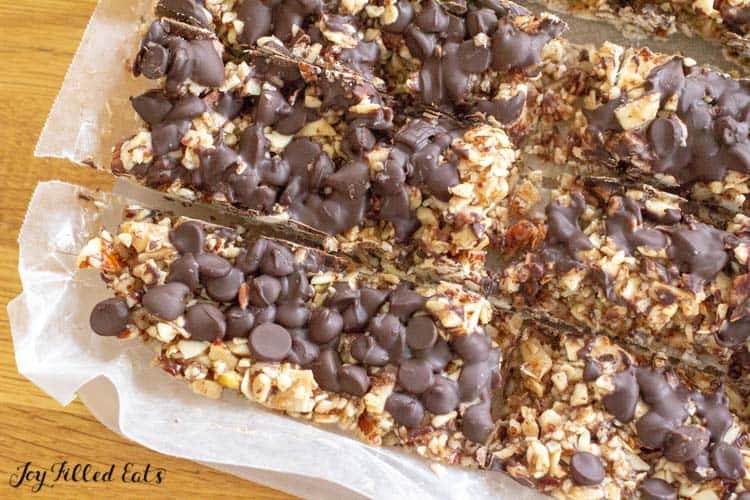 But if the above combination for no bake granola bars sounds good to you give it a try! As long as you have 3 cups of mix-ins to the amount of syrup I have listed it could work. 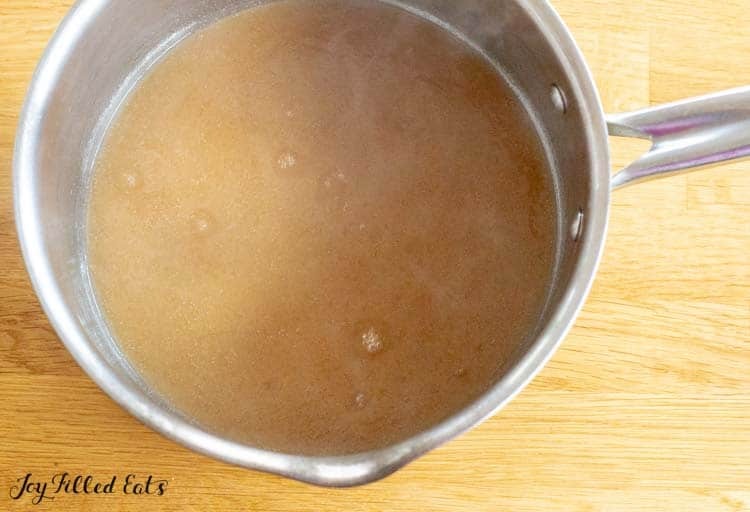 Making the syrup for this recipe is similar to making caramel but you don’t need to cook it as long. You just want the syrup to start to thicken and turn a deep golden color. Once that happens just mix in the nuts and coconut and spread it in your baking pan. Make sure to line the pan with greased parchment or waxed paper or you will have a hard time removing the no bake granola bars later. Next just sprinkle the chocolate chips on top of the still hot nut and coconut mixture. 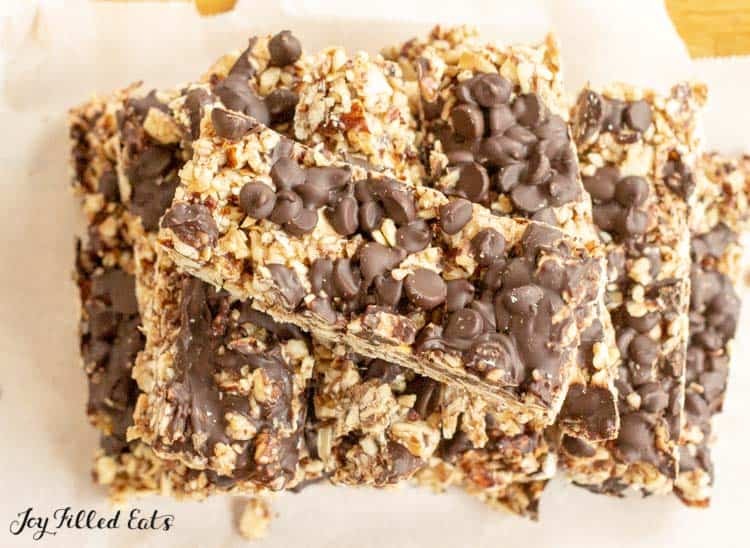 The heat will make the chocolate chips melt just enough the stick to the tops of the homemade granola bars. After that, you just have to chill the no-bake granola bars and then cut them. They cut easily with a large sharp knife. If you are having trouble cutting the granola bars please carefully sharpen your knife and try again. These homemade granola bars stay chewy for a few days but do get firmer and more crunchy with longer storage. This Healthy Homemade Granola Bars Recipe has just 6 ingredients and takes less than 10 minutes to make. My healthy granola bars are the perfect snack! Line a 9 x 9 square baking pan with parchment paper. Grease with coconut oil. 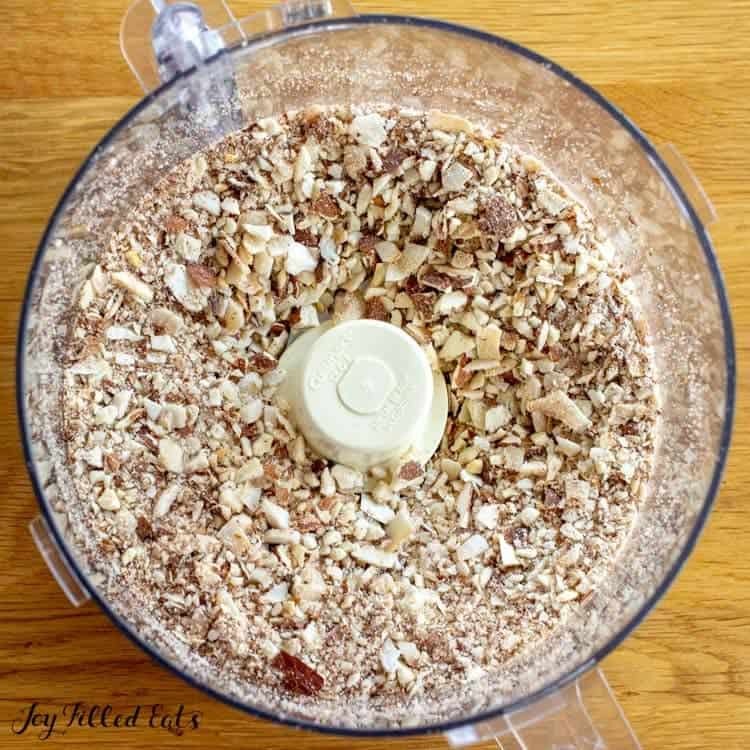 Coarsely chop the almonds and coconut flakes by pulsing in a food processor. Combine the sweeteners and coconut cream over medium-high heat. Simmer rapidly, stirring frequently, until the mixture thickens and turns golden. Stir the almonds and coconut flakes into the syrup. Pour into the prepared pan. Press flat with a spatula or wooden spoon. Sprinkle the chocolate chips on the hot nut mixture. It should be hot enough that they melt a little and stick. Cool to room temperature. Refrigerate for at least 30 minutes. Lift the parchment paper out of the pan. 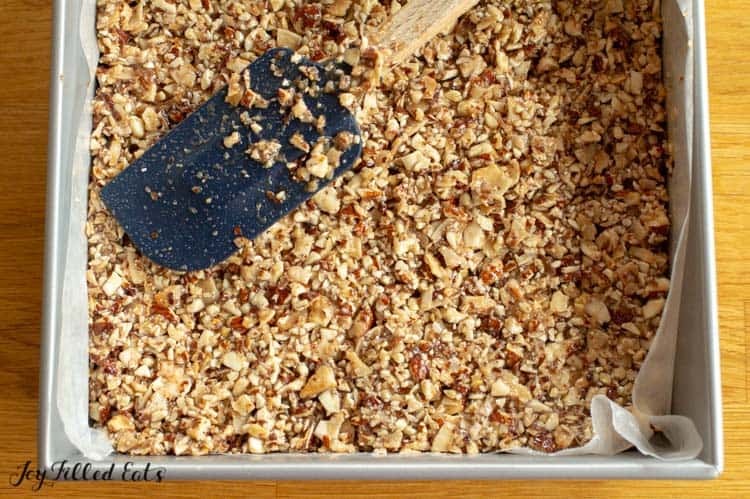 Cut the granola bars using a sharp knife. *** This recipe will not work with a more concentrated sweetener. You need a sweetener that is 1:1 to sugar or you will not have enough syrup to hold the granola bars together. Using 1 cup of my sweetener or Gentle Sweet makes these too sweet. *** I prefer the taste of using both xylitol and erythritol. Using 1 cup of one of those should work but I have not tested it. I am so disappointed. They are too sweet for even my kids to eat. I used 1c erythitol. 🤔 Not sure what I did wrong. I'm surprised. My kids liked them with my sweetener which is twice as sweet as erythritol. I thought they were too sweet with that one but great with just erythritol or xylitol. Which brand of erythritol did you use? You could crumble them up and mix into plain yogurt to cut the sweetness. Or chop and use as a topping on muffins. Can you use a nut combo and leave out the coconut? These sound wonderful!! I love coconut, but my kids not as much. Do these have a coconut flavor or do you mostly just taste the nuts and chocolate? What do you think about adding oats or toasted oats as part of the 3 cups of dry ingredients? Thinking crossover and less coconut taste for the kids. Thanks so much for all the wonderful recipes. Yes, oats would work if you don't mind them being a crossover. You can taste the coconut. The solid part of coconut milk. It comes in little cans or you can chill regular coconut milk and just use the solid. These look delicious. I want to make them for my 10 year old but I am trying to get her to put on some weight. 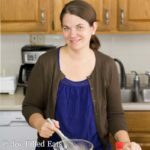 Could I just use sugar to add a few more calories? I realize sugar promotes inflammation and other things but at this point I need to get some calories in her without her having to eat a lot. Thanks! I think sugar would work. These are fairly calorie dense without it though since they are mostly nuts. What kind of coconut cream do you use ? Did you just scrap the cream off the top of canned coconut milk ? I buy the little cans of coconut cream most of the time. But you can chill a regular can of coconut milk and just use the solid part. Where would I find coconut cream in the grocery store? I am new to this. By the canned coconut milk. If you can't find it just chill a can of regular coconut milk and use the solid part. I made these today. They taste great, but they do not hold together. I boiled the syrup until it was dark golden. I cooled them for 1/2 hour on counter and 45 minutes in fridge. then I cut them and ate a small one. It fell apart in my hand. Do they need more fridge time, more boiling...I am not sure what I did wrong. You may have reduced the syrup too much. It should be golden, like in my photo, but not dark. If you make a little more syrup it would help them hold together. Just boil until the sweetener melts and pour it over the bars. Can I use Gentle Sweet in place of other sweeteners? No, sorry. This is explained in the recipe notes. They are too sweet of you use gentle sweet. Super easy to make! My husband is going to love his new snack to take in his lunch! I made a double batch so I could have some too! I'm going to make them again with some other mix-ins! These are so yummy! I love the flavor! I can't wait to figure out what combination of mix-ins to use next! Thanks! I can't wait to try this. I love your recipes, and have missed granola bars! Is there anything that can be subbed for coconut cream? These sound amazing but we don’t use xylitol in our home because of our pups. I’ve been looking at monk fruit sweetener that is supposed to be a 1:1 sub for sugar. Do you think that would work? I think so. But I haven't tried it yet. Please lmk how they turn out. I had the same thought. Monk fruit is such a healthier option. Most monk fruit is mixed with erythritol. I do say that all erythritol should work. Pure monk fruit powder (that is very concentrated like pure stevia) would not work. Are you storing these at room temp, or in the fridge? It sounds like they don't need to be refrigerated, but just confirming. Room temp for up to a week. For longer than a week I'd store in the fridge. I don’t have xylitol, could I perhaps use inulin powder? I’m just not sure if it would dissolve like the other ‘sugars’? I'm sorry I don't know if inulin would dissolve either. All erythritol would work though. If a person was allergic to coconut, can you suggest a good replacement? Just use all nuts. I mention in the post that you just need 3 cups of mix-ins. Nuts, seeds, unsweetened dried cranberries, etc. Is the amount of coconut cream correct? A quarter cup seems like a small amount to wet 1cup of sweetener. Yes it is. You can melt the sweetener without adding any liquid. 1/4 cup is fine. They have 5 net carbs each. So it depends on what macros you are going for. But yes they can be keto.